[Stride]-Stride Step-[Choose one or more cards with the sum of their grades being 3 or greater from your hand, and discard them] Stride this card on your (VC) from face down. 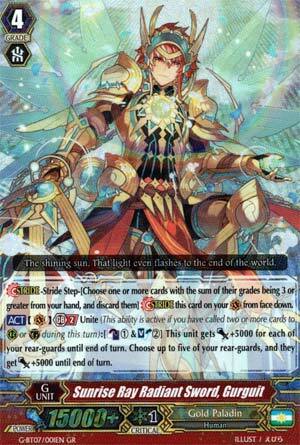 [ACT](VC) Generation Break 2 Unite (This ability is active if you have called two or more units to (RC) or (GC) during this turn):[Counter Blast (1) & Soul Blast (2)] This unit gets [Power]+5000 for each of your rear-guards until end of turn. Choose up to five of your rear-guards, and they get [Power]+5000 until end of turn. The whole reason money-grubbers look to this pack. new Gurguit here has a Unite dependent GB2 that costs Counterblast 1 and Soulblast 2 and is an ACT skill, which powers him up by 5k for every rear-guard you have, then all your rear-guards currently on the board gain 5k until end of turn. Unite's easy enough to fulfill, I suppose, given the number of 1:1 wash units we get that clear a board. As far as 2 Soul goes, that' also reasonably easy...if the aim is to use it more than once. Of course it is, just riding naturally grabs the two soul you need. Because Gurguit's ACT isn't once per turn. That means soul allowing, his whole column can gain 60k and your left and right columns gain 20k. I absolutely do not recommend this unless you need to end a game on the spot and cannot reasonably survive next turn or you're very confident in the opponent's hand size and damage, but it's a thought. I'm just glad new GP got a finisher at all, even if he doesn't actually re-stand like I thought/hoped he would. It's cards like him that explain Denial Griffin, really. Now THIS was the punch that G-Golds needed to become relevant. With G-Guards easing the pressure from Prominence Glare plays, Gold Pals needed a new hero. We now have Soul Saver on steroids. He buffs himself, then he buffs the board. His skill is attached to Unite, but calling at least two units is a piece of cake for Golds, and G-Golds have units that evacuate the board so you're not just calling units over more units. G-Golds have a fine countercharge and soulcharge engine. The only thing that can really stop you is Link Joker, but oh wait: you can just run Ezel Scissors and the Ezel Stride since you have room in the G-Zone for that specific matchup now. Do your homework and put the right rearguards in your deck to maximize Gugrit's potential. Congratulations, G-Golds are officially a threat now. Not every deck can deal with the consistently high-powered columns that this Gugrit yields.